Ayurveda offers a wide range of external treatments to compliment lifestyle recommendations and herbs to regain/maintain health. They have multidimensional effects on the well being of the individual. Apart from the specific effects, all of the Ayurvedic treatments are very relaxing and provide total wellness. Whenever using oil, herbalized oils which are made by processing around 10-40 sometimes even 80 herbs in sesame oil or coconut oil are used for the treatments. The oils are selected according to the body type and/ or health issues. Having 3-7 sessions of the treatment consecutively or periodically provides long lasting effects. Abhyanga is a relaxing m assage treatment using herbalized oil. Most of the herbal oils contain 10 to 20 herbs-some of them even 80-100 -with sesame oil or coconut oil as the base. Each of the oil has special benefits according to the herbs and oil used. Dr Rafeena will select the most suitable herbal oil for you. Massage is done using mainly both palms and tips of the fingers. Abhyanga always begins from head, the root of the body. Then lying on the massage table on your stomach, soles, back of the body will be massaged. Then after turning around, foot, front of the body and face will be massaged. When you are lying down on your back, cooling cotton pads are placed on your eyes to get added benefits. To add the benefits, Abhyanga will be finished with a session of steam therapy where you will sit in a chamber filled with aromatic steam.Read more about Abhyanga..
Ayurvedic herbalized oil massage in which marma/ vital points are treated by applying pressure and varying strokes. Ayurvedic marma massage is a deep tissue massage comparing to Abhyanga/ Ayurvedic oil massage. Ayurvedic marma massage also uses herbalized pain oils where pain relieving and anti inflammatory herbs are processed in sesame or coconut oil. Ayurvedic marma massage is highly recommended for muscle stiffness, neck pain, low back pain, muscle pull, etc. To add the benefits, Abhyanga will be finished with a session of steam therapy where you will sit in a chamber filled with aromatic steam.Read more about Ayurvedic Marma Massage..
Head is the root of the body, so an oil massage to head with specific strokes helps to relieve stress. 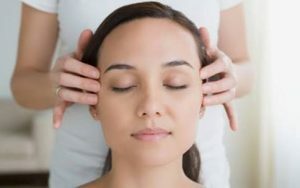 Ayurvedic head massage is recommended for frequent headaches, migraine, hair loss, stress, emotional imbalance, neck pain and stiffness and wellness. 30 minutes treatment includes massaging head, neck and shoulders.Read more about Ayurvedic Head Massage.. Foot has many marma (vital points) and pressure areas. So a 30 minutes session of foot massage gives whole body wellness. Apart from health issues of feet, foot massage is recommended in diabetes mellitus, neuropathies and sleeping disorders.Read more about Ayurvedic Foot Massage.. Here steam coming from herbal tea is channelled to a chamber where you can sit. Alternatively steam can be channelled to your body or specific regions through a pipe. Steam therapies help to improve circulation, dilate the channels in the body and to open the pours in the skin there by facilitating the flow of toxins and their elimination. Sweat itself is a way of taking toxins out of the system. Steam therapies are an essential component of Ayurvedic detox programs. According to the herbs added steam therapies give specific benefits. Also steam is highly recommended in case of aches and pains. During a session of a steam therapy, you will be first prepared for steam by applying oil or by a quick massage with specific strokes. 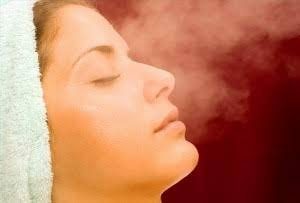 Then you will sit in the steam chamber until you are warm and sweaty.Read more about Steam Therapies..
Shirodhara is a very popular Ayurvedic relaxing treatment where herbal liquids are streamed on forehead. Here warm oil, herbalized butter milk, herbalized milk, herbal tea etc are used according to your body type, season and/ or imbalance. 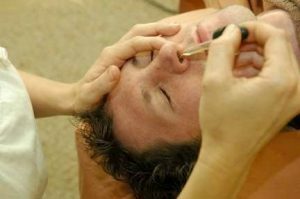 Use of the appropriate liquid for shirodhara is vital to get the desired results. After preparing you with head, neck and shoulders with a gentle massage, the herbal liquid will be streamed at the centre of eye brows which is considered as the third eye, the seat of your higher consciousness or ajna/ brow chakra. The liquids will be also streamed at hair line specifically at the centre of hairline- vital points of forehead. Shirodhara is highly recommended for stress, mental health, emotional imbalances, sleep disorders, chronic illness, boost immunity, etc. A session of Shirodhara can easily help you to get rid of the overwhelming feeling (of anything!) and be grounded. Having 3-7 sessions of Shirodhara consecutively or periodically provides long lasting effects. 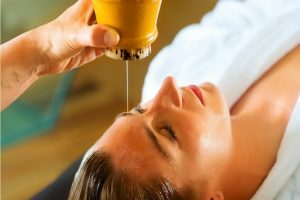 The effects will be multiplied if shirodhara is done following Abhyanga.Read more about Shirodhara..
Ayurveda use s scrub as a way to stimulate the system and improve lymphatic drainage. When oil massage generally lubricates and relaxes the body, therapeutic scrub generally tones and stimulates the system. After smearing the body with Ayurvedic herbal oil (according to your imbalance sometimes udwartana is done without oil), gentle scrub is applied using Ayurvedic herbal powder. To add the benefits, Abhyanga will be finished with a session of steam therapy where you will sit in a chamber filled with aromatic steam. Ayurvedic therapeutic herbal scrub helps to boost metabolism, improve tonicity and relax. Ayurvedic therapeutic scrub is highly recommended for obesity, skin issues, diabetes, neuropathies, venous insufficiency, etc. Having 3-7 sessions of Udwartana consecutively or periodically helps to get long lasting results.Read more about Ayurvedic Therapeutic Herbal Scrub/ Udwartana..
Ayurvedic nasal detox is the process of draining the sinus, respiratory tract and the tissues around. During nasal detox after massaging and applying steam to head, sinus and chest, 5-15 drops of Ayurvedic herbalized oils are poured into each nostril. Oils are selected according to your body type and/or health issues. Ayurvedic nasal detox is one among the detox therapies/ panchakarma and includes in detox programmes. A session of nasal detox can help to relieve respiratory and nasal congestion, head ache, stress, cervical, shoulder and upper back stiffness and pain, etc. As nasal detox helps to provide clarity to mind it’s highly recommended in mental health problems like anxiety, depression, OCD, etc. Sometimes multiple sessions may be required to get the desired long lasting results.Read more about Ayurvedic Nasal Detox/ Ayurvedic Sinus Treatments..
Ayurvedic pouch massage is popular for aches and pains especially for muscles, tendons and joints. In a session of Ayurvedic pouch massage, after applying oil to your body, massage is applied with warm herbal pouch. The pouch is prepared from fresh herbs or herbal powders depending upon your imbalance and pain and is reheated to maintain the warmth by dipping in warm herbal pain oil. Ayurvedic pouch massage is ideal for muscular aches and joint pains.Read more about Ayurvedic Pouch/Poultice Massage..
Rejuvenating pouch massage or SSPS in short is a type of pouch massage with rejuvenating rice cooked in milk and herbal tea. During a session of SSPS, first your body is prepared by applying oil. Then massage is done with pouch of warm rejuvenating rice. Pouch is reheated by dipping in warm herbal milk. Rejuvenating pouch massage is very nourishing and ideal for fatigue, exhaustion, stress, muscle wasting, hypotonic muscles, neuropathy, dry skin, eczema, psoriasis, skin problems, venous insufficiency, etc. Multiple sessions help to get better and long lasting results.Read more about Rejuvenating Pouch Massage..
Kati basti is a deep tissue treatment of low back by forming a well filled with warm pain oil on your low back. Before forming the well, a vigorous massage will be applied on your back to relax and relieve muscles. Oil will be reheated periodically to ensure the required temperature. Kati basti is ideal for stiffness, low back pain and neuropathies of legs.Read more about Kati Basti..
Griva basti is a deep tissue treatment of cervical area. Similar to kati basti, a well is formed out of dove over cervical region and filled with warm herbalized oil. Ideal for cervical problems and neuropathies of arms.Read more about Griva Basti..
Ayurveda offers wide range of other treatments like herbalized oil pack (on head, low back, etc. ), streaming of warm herbalized liquids/ oil over the whole body, etc. which have specific therapeutic benefits. Also different treatments can be formulated or combined to meet the special health issues and needs of you. Duration and cost depends upon your imbalance, the treatments involved and time required.Read more about Customized Ayurvedic Treatments..